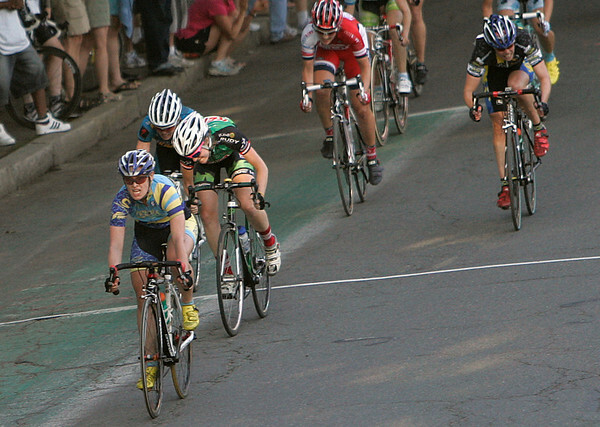 Kat Carr crosses the finish line as winner of the Witches Cup bicycle race in Salem. Carr beat out 28 other competitors in the thirty-six minute race around Salem Common. Photo by Mary Catherine Adams/Salem News. , Kat Carr crosses the finish line as winner of the Witches Cup bicycle race in Salem. Carr beat out 28 other competitors in the thirty-six minute race around Salem Common. Photo by Mary Catherine Adams/Salem News.